Lawson Lane is one of the men named on the Bottesford ‘church list’ of WW1 Servicemen. Lawson Lane was the son of Francis Lane and his wife Betsy (neé Robinson). He was born in 1883 at Great Gonerby, near Grantham. On the 11th January, 1886, he arrived in Brisbane (thanks to the Sabrina Flechsig Family Tree and other public family trees: Ancestry). Other records confirm that his parents travelled to Australia late in 1885, when Frank (Francis), Betsy and son William Lane set sail on the ‘Duke of Westminster’ from London to Brisbane, arriving on the 11th January. Lawson must have also been with his family on this voyage. Then, in 1903, Francis Lane sailed back, from Fremantle to London on board the ‘Ormuz’. The ship left in March, calling at Sydney, and arrived in London on the 11th April. On this voyage, he was accompanied by Betsy Lane and their sons, Wilfred and Lawson. Wilfred (Lawson’s brother) later returned to Australia, where he died in 1938, but Lawson remained in England. By a sad coincidence, Lawson’s second son, also named Wilfred, died in a cycling accident in Stathern, also in 1938. Lawson Lane married Agnes Mary Geeson on the 29th April, 1905, probably in Bottesford. She was born on the 27th December, 1885, daughter of James and Eliza Challands Geeson. Their first child, Eric Lawson Lane, was born on the 10th September, 1905. In the 1911 census, Lawson Lane, a traveller with a brewery company, was at 8, Princes Street, Mansfield, with his wife, Mary Agnes Lane (neé Geeson, 25, from Bottesford) and daughter, Doris Agnes Lane (4, also from Bottesford). 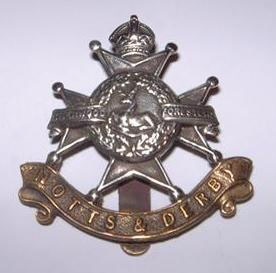 Lawson Lane joined the army on the 29th August, 1916, and was posted as Private 60319, 15th Battalion, Notts and Derby Regiment. He gave his address at the time as “Near Schools, Bottesford, Notts”, his work as a ‘Traveller’. He then spent 2 years and 6 months in France. He arrived at Calais in December 1916 and joined his unit in the field on the 10th January, 1917. He was demobilised on the 31st January, 1919, then transferred to Z Reserve on the 26th March, 1919. His Medal Index Card confirms that he served as Private 60319, Notts and Derby Regiment. He was awarded the Victory and British Army Medals. Agnes and Lawson’s children were Eric Lawson (b.1905), Doris (b.1906), Wilfred (b.1917) and Freda (b.1921). Electoral rolls record that he and Mary lived in Bottesford after the end of the war. For instance, in 1927 Lawson and Agnes Mary Lane lived on Grantham Rd: at the same time John Trophimus and Kate Ann Lane lived in Easthorpe, and Ann Lane lived separately on Grantham Road. Then, in the roll for 1931, Agnes Mary Lane was the sole member of the family registered, living on Belvoir Avenue. The Grantham Journal of the 26th November, 1938, reported “A Sad Bottesford Bereavement – Funeral of Cycling Accident Victim”. The article recounted that Mr Wilfred Lane, younger son of Mrs Lane and the late Mr. Lawson Lane, suffered a cycling accident on Stathern Hill. Mr Lane, a painter and decorator, was only 21 years old. The service was lead by Rev. L.W.Smith, Rector of Muston, and mourners included his mother Mrs Agnes Mary Lane, Mr & Mrs Eric Lane, brother and sister-in-law, and Freda Lane, sister. Lawson Lane died in 1930 and was buried on the 15th of March of that year, at St Mary’s, Bottesford, aged 46. The National Probate Calendar records that Lawson Lane of the Red Lion died in the General Hospital, Nottingham, leaving £562 18s. to his wife Agnes Mary Lane. In the 1939 register, Agnes Mary Lane lived on her own, a widow, on the High Street. She died in the Melton district in 1954, aged 69.